When you need to get there a PSTA bus is a good choice. Most of you who read my Blog regularly know I am not a particularly big fan of the PSTA and especially the PSTA Administration, so this Post may come as a bit of a surprise. Last week, I needed to get to a U-Haul location on 66th Street to pick up a truck for a few days. I did not want to leave a car at the U-Haul store so I thought I would check PSTA Route 79 and see if it fit into my plans. Sure enough, I could catch the 79 at 102nd Ave North and drop off at 40th Avenue North leaving just a short walk to my destination. There was a small first mile issue the stop at 66th Street and 102nd is about a mile away from my home, but a 20-minute walk solved that problem. The 79 was due to arrive at my stop at 4:58 and at 5:00, the bus pulled up. There were about 20 people on the bus, including a man in a wheel chair. We made several stops as we went south on 66th Street. At one stop, another gentleman in a wheel chair came on the bus using the automated ramp at the front door of the bus. The driver helped the passenger into the second wheel chair spot, secured the chair, and we were back on our way. A few stops later, the first wheel chair passenger got off the bus with very friendly assistance from the driver. The second wheel chair passenger exited the bus a couple of stops later assisted by the driver and his very friendly smile. Several of the passengers seemed to know the driver well, and he was friendly, helpful and courteous. Almost 23 minutes to the second, we were at 40th Avenue amazing given the traffic on 66th Street at 5:00PM. As I exited the bus, "Thank you for riding" came as I stepped from the bus for my short walk to U-Haul. Fare $2.25 a bargain to say the least. The demographics of the passengers ranged from students to the elderly. If you need to get somewhere in the County and you don't have a car or don't want to take your car check out PSTA at http://www.psta.net/index.php. There you will find all kinds of information and facts about PSTA that I will bet you do not know. Try out the Transit Trip Planner and it will give you a route and schedule. 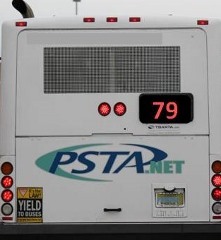 When you only look into the politics of public transportation, it is easy to forget that the PSTA serves a vital purpose in Pinellas County. Too many people it is more than a bus line it is a lifeline.